Google Allo vs WhatsApp: World’s most popular search engine Google has recently launched Allo this year which is Google’s new instant messaging app for Android and iOS smartphones. 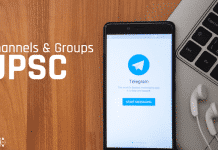 Just like other messaging apps like WhatsApp, Facebook Messenger, Telegram, Hike, Hangouts and may more that are also available for smartphone users which are used to communicate with our friends. Google has created Allo and declaring that it is a ‘smart’ messaging app that comes with some additional and eye-catching features which are definitely not present in other messaging apps not even in WhatsApp which is the World’s leading messaging app for smartphone users. For this reason, some people started proclaiming that Google Allo will soon steal the position and will kill WhatsApp messaging app. So everybody is curious to know about that features of Google Allo which we cannot get in other messaging apps of the virtual chat communications platform. 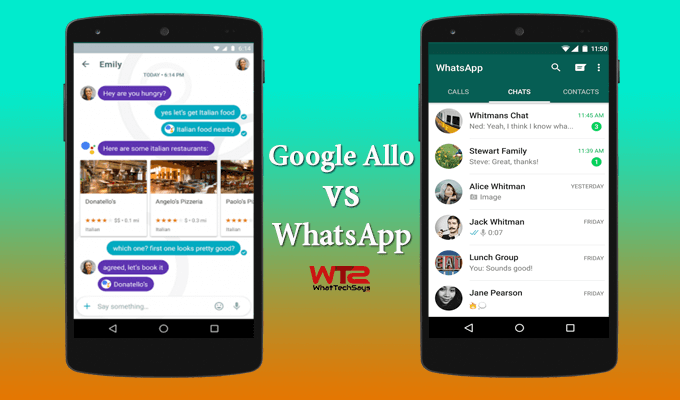 Today I am going to compare the features of WhatsApp vs Google Allo, and after reading this article, based on your understanding, you will decide Goggle Allo Vs WhatsApp: which is the best messaging App for your Smartphone. In this neck to neck comparison, I am going to tell you the best features in between Google Allo vs WhatsApp. This will help you to choose in between these two apps; which is better? Stickers are the best part of every messaging app to express yourself creatively. Like WhatsApp, Google Allo packs a lot of emojis and stickers that users can use to express themselves or add to conversations. But the app moves away from the norm with a feature called Whisper- Shout, which lets you resize text or emoji by dragging up or down on the screen and this feature is lack in WhatsApp, you can only bold, italicize or strikethrough your text. But in Allo, You can just type a text and press hold on the send button to increase or decrease the size of a text. Allo packs in stickers along with a sticker store, where you can download more. The smart reply is the best part of this messaging app as its feature means it reads and analyses your conversation to give you personalized auto-reply suggestions that means this app can provide automatic responses to messages on behalf of the user. 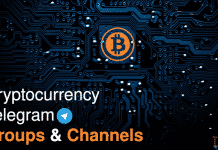 It does this through a software that contains machine learning technology, which gets better at picking up the user’s most frequently used responses based on the usage of the app. For instance, if someone sends you “How are you?” Allo will offer you the automatic response or reply suggestion like “Good and u?”, “I am ok, you?” etc. it is convenient for those who are on the run or too busy to type out a response. This great feature is lack in WhatsApp. Google has incorporated “photo recognition” in this app, and this app even brings you reply suggestions when a picture is sent. For example, if someone sent you a picture of a sunset, it will suggest ‘beautiful’ or ‘wow’ as a response, and you need to choose from it. The more you use Allo, the better your suggestions become. WhatsApp and Allo both assure end-to-end encryption for the chats. Allo allows for end-to-end selective encryption whereas WhatsApp encrypts all the chats and data like voice messages, media etc. Allo only allows selective end to end encryption which means that you can select the contact you want to chat through its “Incognito” chat mode which is similar to Telegram’s secret chats feature. This chat is encrypted as well as the chat history will disappear after you have finished the talk when you have set an expiration period. This app features a self-destruct timer so that you can set your expiration period for the chats ranging from 5 seconds to maximum one week. The chat will automatically expire once the conversation is over. Google Assistant is Google’s latest iteration of a virtual assistant that can answer questions and make suggestions. Google assistant can pull information from the internet, embed YouTube videos within a chat. With Google assistant’s help, you can get everything done in one app. For instance, if you decided to plan a get together with your friend and wanted to invite them through Allo then you can ask the Google assistant to choose a place for dinner and it will suggest restaurants nearby your area at the bottom of the app’s messaging window. Why Use Telegram Instead of Whatsapp? You can tap that suggestion to bring up restaurant cards that everyone in the chat can see. You can call on Google assistant at any time just by typing “@google” and you can use it to get various results like weather info, flight info, recent news, latest games and much more. The information will be coupled with pictures wherever available. Everything works right inside the app, so you don’t have to leave a conversation to check flights, weather, news or anything else whereas we have to leave the group chat or conversation in the WhatsApp for sending all these types of files. Google Allo does not support voice call option in this app whereas WhatsApp allows a user to make calls directly from the app using the internet connection. Simply pull up the contact and hit the phone icon to make a voice call and you can make calls on low-speed networks also. Google Allo lacks the “last seen” feature and does not show you when your friend is online. The user also cannot create any status unlike WhatsApp, whereas WhatsApp supports all these features in its app. Google Allo does not support file sharing. It does not let you share documents, pdfs, etc. like WhatsApp. Allo lets you share pictures, video, and audio recording but it does not share files and documents. A big problem with Allo as compared to WhatsApp is its versatility. Whatsapp can be used on both mobile devices and computers, but Allo doesn’t have a computer interface at all. 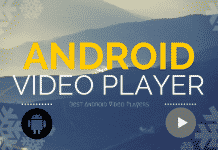 It is currently limited to Android smartphones and iPhone. There is one more problem with the app that it is not syncing. Allo won’t sync your settings and conversations. If you uninstall Allo, you may lose your conversations. This does not happen in WhatsApp; you can easily get your all data if you reinstall this app after uninstalling. This was the comparison on Google Allo vs WhatsApp. Allo is a combination of best features of the best instant messaging apps. As for now, Google Allo may not be the best choice the WhatsApp, it in the near feature it could obtain that place. Plese do share your opinions regarding WhatsApp vs Google Allo. It has a lot of things to improve; especially the customization part. Allo has a lot of things to improve, but it’s the beginning. I’m using Allo since launch. As much as I’d like to love it, I can’t in the current state that it’s in. Whatsapp has WAY more features than Allo, not just those listed. Also, Hangouts was a disaster in terms of performance. Hope they don’t make the same mistakes. Thanks for sharing your experience with Google Allo.